Oh dear, this is dangerous! There's some lovely Kenzo porcelain tableware and glassware with great discounts at Brand Alley today until the 25th (all Brand Alley sales are limited time only, so you've got to get in quickly). 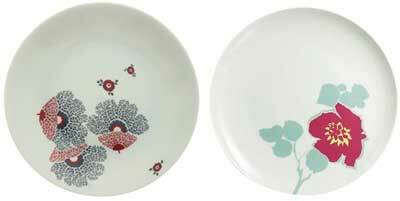 Shown here are plates from the Tao Garden (left) and Azyade collections, reduced to 19.50 and 16.50 respectively for two plates, down from £47, which I'm sure you'll agree is a pretty big price cut. I was going to include more images here, but everything's so pretty that I'll end up showing you every single piece, so just get over there and check it out for yourself. Make sure you take a look at the coloured stemware (especially the romantic Bangalore cocktail glasses at £20 for two) and there's some lovely colourful floral plates for you shabby chic fans. The London Design Festival started last weekend and runs until 23rd September and gives you a great opportunity to indulge yourself with gorgeous design and explore new approaches to products and interiors. The festival shines a light on the creativity and great design talent found in London and beyond via hundreds of events in its extensive programme. 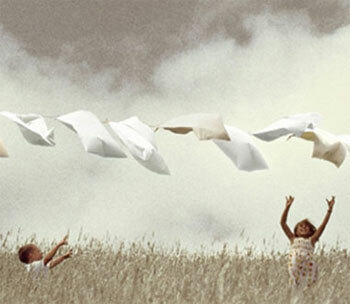 This year we'll be at one of the flagship events, 100% Design - one of the UK's foremost contemporary interiors events. We'll also be visiting Tent London. The exhibition features a range of different design disciplines that incorporates Circa a big vintage design show and the event's heart: Content which allows up-and-coming and established contemporary designers an opportunity to showcase their products. 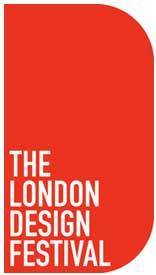 Both events run from the 18th - 21st September and 100% Design is at Earl's Court, with Tent London at the Truman Brewery. Lovely Things reader poll: When should we start covering Christmas? It's always a tricky one where Christmas and the holiday season is concerned. I don't like to start writing about it too early, but I know some of you get organised months in advance, especially when it comes to decorating and securing the best tree ornaments. Given that we're already starting to see readers visiting Lovely Things via search terms that bring up our previous Christmas articles (like the ever-popular blue Christmas decorations feature from two years ago), I thought it best to ask you for your opinions using a simple reader poll. So please give us your honest opinions, and feel free to leave additional comments too. Debenhams is running a mini sale starting today and ending on Friday 12th, offering up to 20% off almost everything in the store and online at debenhams.com. 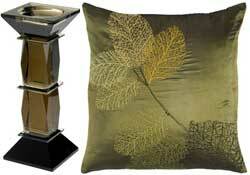 Shown here is the olive smoke glass candle holder from Star by Julien Macdonald - was £30, now £24, and the green embroidered leaf cushion - was £20, now £16. This weekend sees the launch of the Soil Association's Organic Fortnight, a celebration of all things organic in the UK from 6th-21st September. There's a whole host of events running all over the place focusing on food and drink, beauty and textiles. To find out what's on, or to host your own event, visit the Soil Association website. To celebrate this great event, read on to take a look at some lovely organic bedding for your home (the gorgeous image above is from Dorma - more details via the link below). If you're interested in original art on a budget, you'll be pleased to hear the time for the Autumn Collection of the Affordable Art Fair is rolling around. The biannual event showcasing art under £3000 can be a great opportunity to try and nab a bargain piece from a favourite artist, or discover something new. Pictured is 'Dans le Bois' (click link for larger image), by Seng Soun Ratanavanh - a lovely take on the Little Red Riding Hood story in greys with bright splashes of the eponymous red. 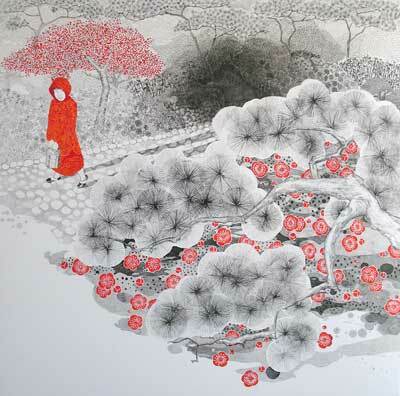 It's Chinese ink and acrylic on canvas, 100 x 100cm and available at the fair for £2150, from Enviedart. The Affordable Art Fair - Autumn Collection takes place from 23rd-26th October 2008 at Battersea Park, London, with a private view on the 22nd. Even on not particularly hot days, sometimes you need to get the air moving a little bit for comfort. 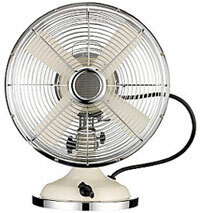 This retro-style desk fan in cream has caught my eye and offers three speed settings for your perfect cooling breeze. It's 36 x 25cms, comes with a three-year guarantee and is also available in red, chrome and black. £45 from John Lewis.